EDMONTON - One politician who wants to be Alberta's next premier is reaching out to potential voters through their stomachs with a sizzling backyard barbecue contest. Another is promising to pretty up half-ton trucks with pictures of bighorn sheep on vanity plates. THE CANADIAN PRESS — EDMONTON - One politician who wants to be Alberta's next premier is reaching out to potential voters through their stomachs with a sizzling backyard barbecue contest. It's all part of an effort by the six candidates in the Tory leadership race to catch people's attention this summer. Political scientists agree the corny ideas might work because, they say, the race has nothing to do with policy and everything to do with selling party memberships to garner votes. "If someone's willing to come out and flip steaks in your backyard, especially if they're bringing them, that certainly will attract some attention. And that's what they need to do," says Doreen Barrie with the University of Calgary. She says it's difficult for people to focus on politics over the summer, so a backyard barbecue might be more appealing to sun-seekers than a stuffy town hall meeting. "Who knows?" Barrie laughs. "The next candidate may come up with some special spray for mosquitoes at a garden party." Gary Mar, who held several portfolios in previous cabinets, says the idea for his barbecue contest came from time he spent as Alberta's representative in Washington, D.C. He watched as President Barrack Obama's winning campaign showed who he was as a person, not a just a politician. "Public policy is very important, but people also want to know that you are a person that they would like," says Mar. "So I'm trying to convey to people a little bit about what my personal interests are, which include cooking." A splashy video set to music on his website shows an apron-clad Mar grilling an Alberta flank steak soaked in his homemade marinade. Mar says his father once owned a steakhouse in Sherwood Park, and cooking is his creative outlet. "You supply the backyard ... Gary will bring the food and drinks," says the contest ad. All one has to do to enter is sell party memberships, follow Mar on Facebook and Twitter, or sign up friends for updates. "A backyard barbecue? That's a new one," says Bill Smith, president of the Progressive Conservative Association of Alberta. He says old-fashioned pancake breakfasts and coffee parties are still on most agendas, but candidates are jumping onto Facebook, Twitter or YouTube, too. Social media proved effective for Obama as well as for Calgary Mayor Naheed Nenshi during his election win last fall, Smith says. So the party is also going high-tech to reach more Albertans by streaming all-candidates forums live on its website. "Having a barbecue competition, that's not my style," says backbencher Doug Griffiths. "In my mind, that's not the essence of politics." He prefers an "organic" approach of talking to people about the issues, and social media helps bring more voices into the discussion. At 38, he's the youngest contender in the race and says he was thumbing tweets on his BlackBerry well before he dropped his name in the hat. "I'm probably the only one, honestly, that will not just use Twitter to win the leadership. I'm going to use it after to talk to Albertans too," Griffiths says. Former justice minister Alison Redford concedes the technology is new to her but she has gone so far as to attend campaign "tweetups," events where people who talk on Twitter gather in person to hash out issues. "I think it takes the level of political dialogue to some place completely different than what I've ever experienced," she says. She predicts that social media will transform the way politicians do their work. "Just proposed a Robert Bateman-designed licence plate," Ted Morton tweeted to the world last week. If elected premier, the former finance minister says he'll put the artist's wildlife drawings on vanity plates and give the proceeds to conservation efforts. The leadership race is a serious competition, says Kevin Weidlich, a campaign manager for former deputy premier Doug Horner. "But we don't want to be boring either," he says. Horner's campaign is holding a draw for an intimate dinner out to talk one-on-one about politics with the candidate. One-time cabinet minister Rick Orman, who finished third to Ralph Klein in the 1992 leadership competition, says he never used Twitter before this race and finds it useful. But he likes face-to-face contact more. "The thing that hasn't changed is the personal touch. People still want to meet the candidates, they want to look them in the eye, they want to visit their soul and see what they can see." Orman agrees the race is about meeting people, having those people talk to more people, and getting them all into the party to vote. "This leadership is just a sanctioned Ponzi scheme," Orman says. It's like selling Amway products, adds Duane Bratt, a political scientist with Mount Royal University. "You get an extra 50 people out, they get an extra couple people out, and it starts to build," he says. "That's why Ed Stelmach became premier. It wasn't because he had the most penetrating ideas or people believed he was the best leader. He had the organization on the ground." Stelmach served Klein as a cabinet minister in three portfolios before winning the vote to replace him in 2006. He was seen as a longshot but came up the middle between heavyweights Morton and Jim Dinning. 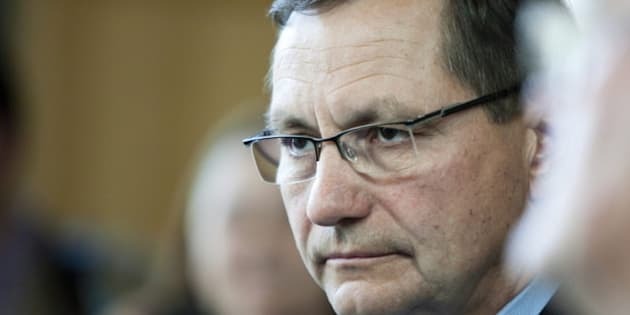 Stelmach, wounded by personal poll numbers and facing a fractured caucus over an upcoming budget, announced in January that he would step down. The new Tory leader will automatically become premier.